Windows Hive news Idea Cellular Enables Carrier billing for Windows Phone store in India. 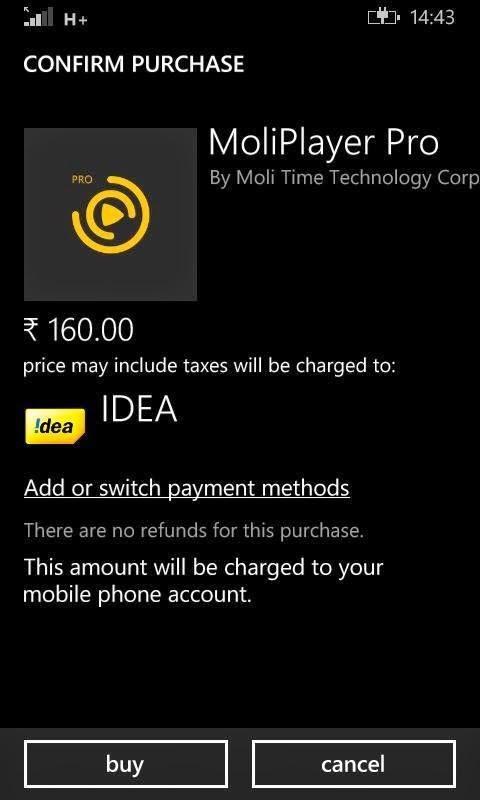 Idea Cellular Enables Carrier billing for Windows Phone store in India. Usually if i want to buy an app from windows phone store i used to pay via my credit card or Microsoft account. This was the case for pretty much all of the people using Windows Phone until now. Things wont be the same all the time. In the same way now it changes for me at least. It seems Idea cellular India has quietly enabled carrier billing for Windows Phone Store. Many of the people are waiting for this feature. But idea cellular only contribute 15% of nations connectivity so remaining 85% of people don't have this feature. Hopefully it seams like it depends on carrier so it wont take long for all carriers to enable this feature. So cheers guys let us know in the comments below what do you think about this feature.